(5) To develop the citizens’ (geo) political sense of the Serbian nation belonging to the Judeo-Christian and European civilization. First of all, we want to emphasize that the notion of avant-garde is not a part of our name so as to describe the status of the members of the Association. We, the members of the NA, we are not the avant-garde. Here, the word is not used in order to describe a group of people. Something else is at play. We think that an evolutionary leap is necessary in the collective consciousness of what we call the Serbian national movement. All the members of the Serbian nation who are politically and/or culturally devoted to the national idea among the Serbs, all those who consider themselves nationally oriented and who are simultaneously politically active at least as voters in the election compose what we call the Serbian national movement. All the individuals, organizations and parties. From our point of view, it is vital for this movement that its collective political consciousness reaches a new stage in its development. That is what is avant-garde, that is the avant-garde – the national avant-garde. The progress of the national idea. Not only in the minds of the few, but to have its confirmation in public among the majority. It follows that the National Avant-garde is a group of people who shall serve as advocates of the avant-garde of the national consciousness among the Serbs. There are three pillars of the avant-garde thought and action. The first pillar is ideological. We will profile and affirm an archeofuturistic/archeoprogressive approach to the understanding of the national idea, culture and identity. If the economic right focuses on the private property and profit, then the cultural and social political right focuses on identity. The identity is the Alpha and Omega of the national political community. The collective identity and the safety of the same collective have been closely related ever since the ancient polis. We are witnessing the suppressing of the national identities under the impact of the process of mondialization. Archeofuturism/Archeoprogressivism as a basis should enable us to project the pre-modern patterns of the cultural identity into the future of technological and social development of the European civilization. This means that the idea must be postmodern with a national omen. The second pillar is practical, political and social. To put it simply, the historical goal of the Serbian nation is liberation and unification, as with all the other European nations. Therefore, an active state politics of Serbia is necessary for Kosovo and Metohija, Montenegro, the Republic of Srpska and the Serbian national minorities in the neighbouring countries. This has been a historical goal. Such goals are accomplished through a fight of several generations of a single nation which is politically unified and oriented towards the goal. We consider it a mistake for individuals, organizations and parties who are not in power to even deal with these issues. It would be as if a citizen with an average salary, average amount of property and an average family planned and truly expected to build a spacecraft to leave the Earth’s atmosphere during his lifetime. If this was not the case, the aforementioned polis would not have been created. People join together and form collectives which can accomplish much more than an individual or a small group in a shorter period of time. This is why we believe that today the Serbian national movement cannot even have effect on passing of an ordinary law let alone regaining control of Kosovo and Metohija. Especially in the state of total fragmentation and disunion it founds itself today. This is why a prioritization of goals is necessary, as well as devising a long-term plan for which support should be built up later in order to implement it at the national level. We believe that the primary and the most important Serbian front is neither located in Knin, nor the Republic of Srpska or Kosovo and Metohija, but in Belgrade. Belgrade is the capital city, the brain of the nervous system of Serbia. This brain is dominated by the non-national elite in the cultural, political, educational and every other sphere. “The Other Serbia” is geographically located primarily in the city centre known as “the Circle of the deuce”. Their power has existed and been renewed for decades. Hundreds of signatures that the presidential candidate Saša Janković has received are the action of that elite which possesses extremely strong political consciousness. That elite possesses highly developed awareness of collective identity and their social goals. It is not Janković who gathered them, it was they who chose to offer their support to him. Their political consciousness has Comintern roots. Our attitude that the task of our generation is to recover Belgrade through institutions of a modern, civil, liberal and democratic Serbia stems from this. What is still our advantage, but not for long, is that there are more of us. This means that we can free Belgrade from the anti-national sediments of the “deep state” in a democratic electoral process. Therefore, marching through institutions. In order to achieve this, a new subject of the Serbian national project is necessary. It is a new circle, a national circle which would oppose the circle of the deuce of the Other Serbia. If we succeed in this, we have laid the foundation for a new generation of patriots to politically unite Serbia towards further accomplishing the historical goal of the Serbian nation – towards liberation and unification. In order to achieve the creation of new national elite, it must adopt the patterns of social and technological development. The Serbian national movement must be freed of any anachronistic, social and technological patterns so that the identity mould can be integrated into the progressive and the civic. The third pillar is precisely about the abovementioned subject of the national avant-garde. The subject of national avant-garde must be a new elite which does not exist as a collectivity. There are only individuals who pave the way as beacons of national freedom. This means we have to use all of our existing experience and all the existing prominent intellectuals while planning the development of a new social capital. New generations of young, educated people who foster national feelings and awareness of the historical national interest as well as the position of Serbdom in the contemporary times. Why a Hoplite helmet and a book? The idea of archeofuturism/archeoprogressivism means projecting of the pre-modern into the postmodern so as to surpass (bypass) the experiences of modernism which stand in opposition with the heritage of the American and the Serbian revolution. The goal is to bring heritage and identity into the future. The Hoplite helmet is a symbol of the Ancient and Hellenic civilization, as well as the Mediterranean. If it had not been for the Hellenic culture, Rome would not have been what it had been. If it had not been for Rome, there would not be a Christian Europe. If it had not been for Rome, there would not have been the Second Rome embodied in the Roman Empire – Byzantium. There would not have been the Third Rome, embodied in the imperial Moscow. If it had not been for these civilization, there would not have been the Christianized Serbian tribes, and consequently the Nemanjić dynasty and our entire culture. This symbol can also be used for all the other European nations and it is pan-civilizational. It is a symbol of the desire to determine the roots of our identity – archeo, so that we can project it into new social and technological forms of the future. The visor of the helmet is facing right. The book is present so as to confirm that an intellectual circle is in question. 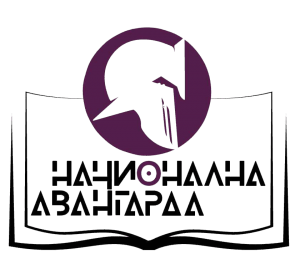 A book symbolizes our intention to create new thought and new elite of the Serbian national movement. Purple colour is the colour of the Roman (Byzantine) imperial family. We have noticed that, after the KONBES on 5 October 2018, the Other Serbia elite swooped on the dangerous attempts, dangerous to their ideas, to reconstruct the national thought when attacking the NA. What bothers them the most is our attitude that the ideas of progress must be connected to identity. Their thought is at the brink of extinction. They have no intellectual heirs in a collective sense. There are objectively few people of quality among the individual heirs from the generation of millennials, as opposed to the older echelon from the generation of baby boomers and the generation X. The older generations have properly identified the danger for their thought to be retired, together with them, by the new understanding of national identity which the small number of their heirs will not be able to win against in the plane of objective arguments. Namely, they were safe as long as they exercised monopoly over the idea of progress and advancement of society and technology. They were sure that people of quality would move to the anti-national side, not necessarily out of hate towards identity, but out of the need to belong to the progressive portion of the society. Now, when the national side is putting forward a perspective of progress and social affirmation, they are attacking the National Avant-garde in panic in different attempts to discredit it. Those attacks are predominantly fabrications and falsehoods. Learning from this, our thought is developing and getting stronger. Apart from the word archeofuturism, we shall introduce another neologism – archeoprogressivism. The word archeoprogressivism shall be added next to the word archeofuturism in the text of the Manifest. The term shall be used as a synonym for the same notion of merging identity and progress. Thus, we will additionally emphasize the independency of our political thought which is based on the notions we create and not terms we use. We assign a meaning of a notion through creating an original political thought. The terms we use are of secondary importance which we have demonstrated in the discussion in the weekly magazine NIN, where we heavily defeated the self-proclaimed Bolshevik Jovo Bakić with arguments. In our discussions with Teofil Pančić, Jovo Bakić and Vesna Pešić in the magazines NIN and Vreme (The editorial board of Peščanik declined to publish our response to Vesna Pešić, which came as no surprise), it could be seen that the Other Serbia is very bothered by the advancement of the national idea and our attempts to pull it out of the premodernism. In order to set us back, they stigmatise any type of progress on the national side as fascism. Why? Not because they truly think we are fascists, but because they want to taint any attempt of the nationally conscious to politically leave Middle Ages. In fact, two types of national ideas are convenient for them: the first – whose consciousness places it in the Middle Ages with the Emperor Dušan and the second – which is a fascist ideology of losers. That is why they will label the democratically and nationally oriented as one or the other. The first ones are retrograde and as such have no future, and the other ones are evil. It bothers them that we agree on this with them, as we are neither retrograde nor evil. We are national democrats. And now they will say – how can democrats be dissatisfied with modernism? And we will say – we are dissatisfied with those parts of modernism that destroy identity. We accept the parts of modernism that signify progress without suppressing identity. That is why we deem it necessary to further explain this part of the Manifest of the NA. As we have emphasized in our response to Teofil Pančić in the magazine Vreme, the NA accepts the heritage of the American Revolution from 1776. To this we add all the heritage of the Serbian revolution from 1804–1815. The revolutions which signified national liberation from the foreign authority and which simultaneously led into a social emancipation and technological progress.